“A righteous man regardeth the life of his beast: but the tender mercies of the wicked are cruel” (Prov. 12:10). I know I should not get frustrated or worry about things I cannot change, but it is difficult not to feel that way when I am awakened at 3:00 AM by the sound of an animal being killed in a most brutal way. Let me hasten to say I am not a PETA person. I fully believe God has given man power over every living thing (Gen. 1:28), and that we have permission to eat whatever necessary to have strength to serve Him (Gen. 9:3). But when a wild sow screams for more than an hour, one has to ponder what should or could be done to relieve her agony. 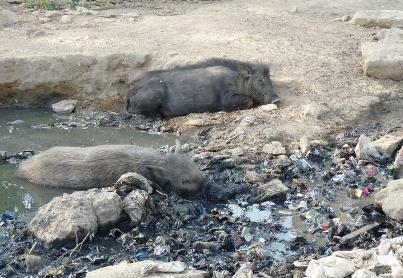 I have seen the wild swine forage through the garbage dumped in the empty lot next to my house. I often see them running across the road to find a ditch of water or a place to hide—ever wary and watchful. When they are smaller, they have to fear the ferule dogs. As they grow larger and fatter, they tend to feed only at night for fear of people. Gypsies and poorer folk are looking for protein and catalog where the pigs feed. They want to have food for their families. I have no problem with that need, but the LORD OF THE FLIES killings are what make my chest pound and my blood run cold. At times, when pigs are not killed on the spot, they are tied to the back of a bicycle with legs and head dangling at odd angles. Having them taken away quickly is at least more merciful for the residents who are trying to sleep. At times like this, I have to keep reminding myself that humans are far more valuable than animals, and yet God even cares for the animals (Matt. 10:29-31; Luke 12:6-7). He made a covenant with Noah and his family and the animals that he would never again destroy the earth with a flood (Gen. 9:12-17). Along with that promise God gave Noah a warning not to eat the blood with the animal (Gen. 9:1-5). This command is being disobeyed by many in third world countries today. As I tried in vain to find a way to stop my ears, I couldn’t help thinking of how often humans have died unmerciful deaths at the hands of other humans. James died by the sword (Acts 12:1-2). Even if the apostle Peter were not crucified upside down, we know that he died a violent death (John 21:17-19). Early Christians were often burned at the stake. “And others had trial of cruel mockings and scourgings, yea, moreover of bonds and imprisonment: They were stoned, they were sawn asunder, were tempted, were slain with the sword: they wandered about in sheepskins and goatskins; being destitute, afflicted, tormented; (Of whom the world was not worthy:) they wandered in deserts, and in mountains, and in dens and caves of the earth” (Heb. 11:36-38). As I lay there in the dark, I thought of all innocent babies who have suffered and died at the hands of abortionists and of people like Terri Schiavo who have been starved to death for no fault of their own. Murders will pay one day! Job speaks of God’s care for the animals: “In whose hand is the soul of every living thing, and the breath of all mankind” (Job 12:10). The Psalmist also speaks of the Heavenly Father’s care by saying, “Thou openest thine hand, and satisfiest the desire of every living thing” (Psa. 145:16). We need to be sure our children are trained not to be cruel to animals no matter the species. Don’t for a minute tolerate a little boy’s pulling the legs off a grasshopper. That little boy’s heart is being trained, and who knows whether he might do something similar to a human one day? Completely agree with the post. It makes to think that whether we are treating animals fairly? I don’t see message on animal cruelty very often. Thank you for the short yet beautiful message! I have thought about your comment more than a few times and wondered if man’s inhumanity to man is more cruel than man’s cruelty to animals? You know what, Kevin? I probably am the slowest respondent ever. I am sorry I did not answer you right away, but let me say a belated thanks for noticing the article and writing. It is my humble opinion that Christians should not be cruel to any life form–whether animal, human or even insect. Cruelty of any kind should be left to the barbarians.